Here are some facts about the River Clyde. 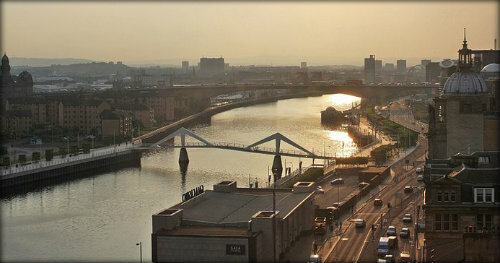 The River Clyde is Scotland’s third longest river and the 9th longest in the UK. It is 109 miles long and flows from near Daer Water to the Firth of Clyde. There are over 70 bridges spanning the River Clyde, including the distinctive Clyde Arc. The Clyde Tunnel, which opened in 1963, took 7 years to build and is the length of 7 football pitches. Shipbuilding was an important industry on the Clyde during the 20th century, especially during World War 2. The QE2 and the Royal yacht Britannia were built on the river. The last ocean going paddle steamer in the world, the Waverley, was built on the Clyde in 1947. It still operates today, providing river excursions to tourists. The massive Titan crane at Clydebank is over 100 years old and was able to lift over 150 tons. It has now become a popular bungee jumping spot. The upper stretches of the River Clyde are good for fly fishing, especially trout and grayling. The lower stretches are good for salmon and sea trout. Shipbuilding has declined in recent years and much of the Clyde waterfront has been used for other purposes. The Glasgow Science Centre and a major exhibition centre have both been built here. The Falls of Clyde are four waterfalls on the river, near Lanark. The surrounding area is home to over 100 species of bird, including rare peregrine falcons. Because of the high concentration of industry, the areas around the Clyde were heavily bombed during the WW2. On just two nights in March 1941, over 1,000 people were killed and 16,000 houses destroyed. Clydebank, in particular, was very badly damaged. Clyde View Park is a popular Glasgow park which is next to the River Clyde. The park’s sculptures were designed by children from local schools, to represent the area’s history. What next? Discover facts about rivers by visiting our river resources page.